You will need to consider every aspect of your planned activity and any associated costs. Having sufficient funding to cover the costs incurred by schools as a result of participation in your activity, particularly travel and staff cover, is a further incentive for them to take part. If you need to apply for specific funding to support your partnership or activity contact your Public Engagement with Research unit or equivalent body e.g. in Staff Development or Research and Innovation Services (for Southampton contacts see the Useful links and contacts section). Below are some typical items that incur costs to consider. 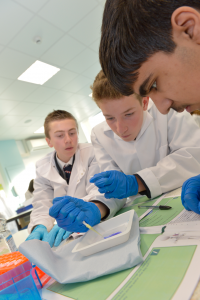 Year 9 pupils load electrophoresis gels with different genetic samples at LifeLab.